Kenton has got me thinking about SMS tonight. He’s been looking at ways to enable our users to sign up for SMS notification of their Sirsi account status, e.g overdue notices, holds, and the like. Providing an alternative delivery method for people to opt into simply gives our users a little flexibility — never a bad thing. The other side of the SMS/libraries coin is of course, what are the potential reference applications of such a mobile service? I was interested to read tonight that Southwestern University will be launching a pilot service using Altarama’s Reference by SMS package. I’m hoping Southwestern reports back on how the service plays out for them. Regardless, I can appreciate projects like this that at least take a shot at meeting the millenial crowd on their own turf (although I read in the local paper tonight that at Telus is attributing much of their text messaging growth to the business crowd. 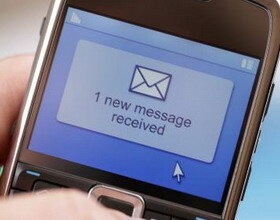 Text messages were sent in Canada, doubling the number sent in september. Astounding. My wife and I have started to text message each other with stuff that doesn’t require a phone call. “Don’t forget the eggs,” “I’m going to be late for supper,” “Did you see my car keys this am? Help!”. I have to say – messaging really is a handy tool, even if it does currently take me just as long to text message a five word question as it does to write a 1000 word blog posting on my PC. Only kidding. It’s not that bad. Practice makes perfect. And when it doesn’t, there’s Fastap. One other cell phone related service that I’m starting to give more thought to is good ol’ fashioned “talking.” That’s right – cell phones are great for SMS, but we can also talk on them. Since so many users are walking around with them in their pockets, I really do wonder if there isn’t a way that we can better advertise or administer phone service, so that users can find out what floor has that call number they’re after, what time the library closes that day, or what keyword might get them the answer they need. We do have phone service, but I think its been somewhat muffled as we pay most of our attention to working out the quirks of chat reference, email, and other IT-related services. But of course, that means that people might talk, which will no doubt cause some of you to raise your eyebrows and click through to the next blog. I don’t know. I’m thinking most of the conversation would be outgoing — them calling us, no bad midi file ringtones to contend with– and that we could likely work around where they call from. Cones of silence dropping from the ceiling, perhaps. The short of it is that they call their friends and parents now, so maybe a call to the librarian isn’t such a bad thing? ?